Distracted driving is defined as any activity that might divert a driver’s attention away from the important task of focusing on the road. All distractions can create a very real danger to drivers, passengers, and bystanders. Unfortunately, although truckers drive for a living and understand the dangers of traffic, they’re not immune to the effects that distractions can cause on driving abilities. When a distracted driver is operating a truck, the danger increases because of the size, weight, and poor maneuverability of these vehicles. Furthermore, because truckers often have to perform multiple tasks when driving, they are more susceptible to causing an accident as a result of a distraction. Programming navigation systems. Truck drivers often haul loads to unfamiliar destinations. Many simply can’t perform their jobs without the help of navigation systems. And although they are helpful, they can cause a driver to take his eyes and focus off the road and cause a major accident as a result. Adjusting CB radios. 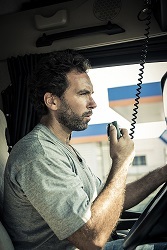 Truck drivers communicate with each other through the use of radios. Using and talking on this equipment can cause the driver to lose focus on what is going on ahead of him, which can cause a crash. Eating. Truck drivers are expected to get their loads to their destinations rather quickly. Sometimes these tight schedules prevent them from taking proper breaks, and they are forced to eat and drink while they are driving. As you may imagine or know from experience, doing so while driving can cause you to become distracted. In addition to these “normal” distractions, truckers are also vulnerable to a host of other potentially dangerous diversions. The two most common types of distractions among drivers are texting and cell phone use. Although generally associated with teenage car drivers, truck drivers distract themselves with cell phones and tablets just as much as passenger vehicle drivers. Unfortunately, by doing so, they increase their risk of an accident tenfold, on top of their already elevated risks for causing a collision. Texting. Texting requires a driver to look at his phone and focus his attention on the message he’s typing, rather than focusing his attention on the road and driving safely. Texting while driving can be as dangerous as drunk driving and although prohibited for truck drivers, many still engage in the dangerous activity. Talking on cell phones. Although talking on a cell phone does not require a driver to take his eyes off the road, it does require him to split his focus between everything he sees and everything he hears. A person can’t place all of his attention on two different things, and a truck driver must be able to place 100% of his attention on his driving. So that leaves 0% for a phone call. Entertainment. In addition to the more common distractions, truck drivers are on the road for a long time and are distracted by entertainment methods such as the radio or MP3 player, books on tape, and videos. Fatigue. Truck drivers often are on the road for twelve or more hours a day, driving the same stretch of highway for miles and miles and miles, without sufficient rest periods. As a result, fatigue and boredom can cause a trucker’s mind to wander…and with it, his rig. For more information on truck driver distractions, risks, and liability, feel free to browse our extensive collection of articles. Having spent more than two decades helping truck accident victims gain control of their claims and recover from their accidents, we have learned everything you need to know about pursuing a truck accident case—and we want you to learn it too. Our website can reassure you that we have the experience and know-how you’ve been searching for to file an injury claim.